I have recently been getting my riding fix with a gorgeous little Haflinger-Cob cross dressage pony. This dinky but muscular ball of energy has always caught my eye for the unlikely transformation he makes into the most elegant and impressive ridden pony, when given the right rider combination. While I work on being that rider(!) 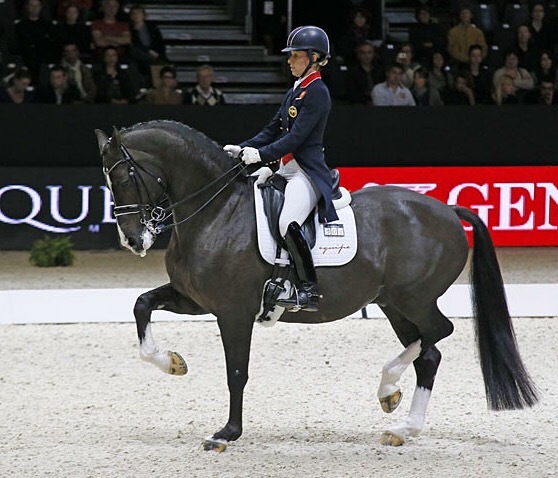 it got me thinking, is there an ideal dressage conformation, or is the ‘diva gene’ the overwhelming factor in dressage success? Top dressage riders often report the need for an intelligent, ‘hot-headed’ and overly sensitive horse to train up in this discipline, in order to ensure the necessary learning potential, forwardness and power required. Power is key, but this power must be harnessed effectively to give the uphill and seemingly effortless visual result. The flair (‘expression’) cannot easily be trained however – surely the horse must WANT to show off to that crowd?! To the left, Moorlands Totilas, record breaker of his time, had expression coming out of his ears- pictured doing his infamous extended trot, his long elegant limbs could produce the most impressive lines, and he oozed star quality. 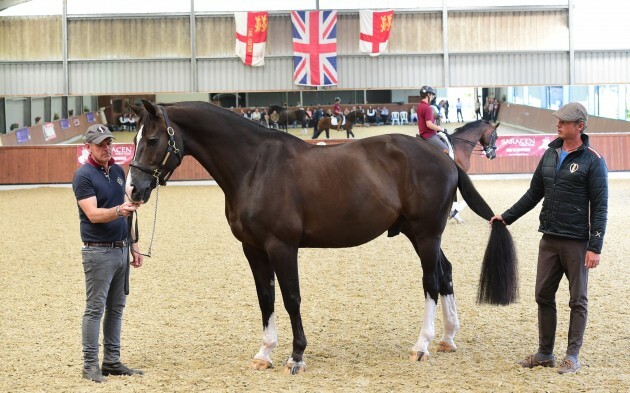 Then along came the one on the right, Valegro, so different to Totilas – bulky, muscular, almost cob-like! 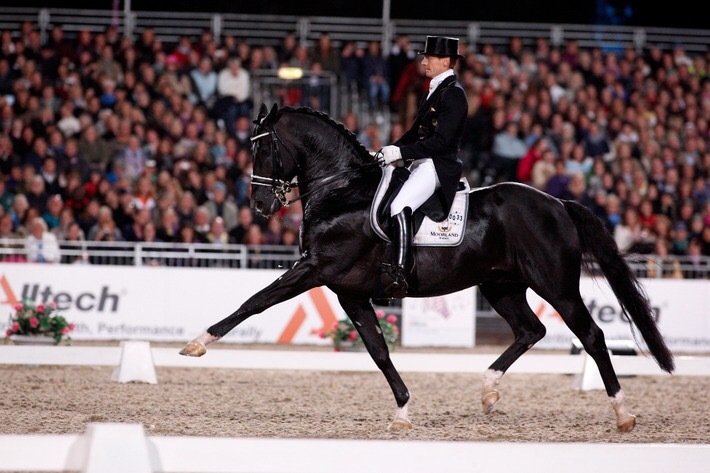 – yet smashing all of his records and stealing all the top dressage titles. Perfectly in-tune with his rider, he produced some of the most accurate all-round performances ever seen. Shown here performing his outstanding piaffe/passage movements, what he lacked in elegance he more than made up for in power and precision. From an ethical point of view, increasing demands of top level competition often tip over from harmonious to stressful or even painful for the horse. Notably, neither horse in their mid-competition pictures above look ‘comfortable’ or ‘relaxed’, particularly in the case of Totilas, who was the subject of many ethical debates over him increasingly exhibiting signs of stress and then injury which lead to his retirement from the sport. I have seen first hand the extreme but essential stretches the horses choose to do during cool-down after such a test – the need to practically drag their heads along the floor for 20 minutes to release those tense muscles does not indicate complete harmony and willingness to me. I wonder whether the enjoyment and ‘diva’ quality of these horses is being somewhat inhibited by the tense and unnatural frames which are now the norm. Luckily, being an incredibly uncompetitive rider myself means I will never need to consider this debate – I am far too much of a softy to expect that level of commitment from any equine partner I may have :). In those rare moments where my riding actually complements this pony’s diva personality in the arena, we just might accidentally produce some dressage! Very interesting. I often wonder how these top dressage horses would perform if they were just in a basic bit like a loose ring snaffle.To me using such strong bits in top dressage minimises the skills needed to get a horse into an outline.No wonder they need such a long stretch afterwards.